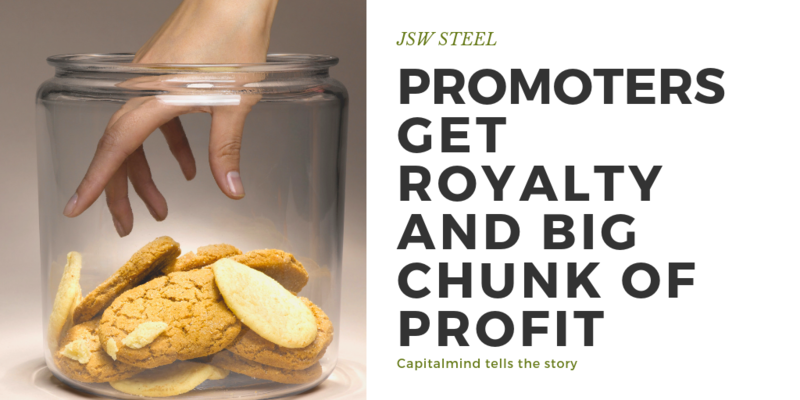 In a shameful episode, the promoters of JSW Steel have claimed complete ownership of the “JSW” brand, and decided to pay a company owned by Sangita Jindal (wife of the promoter Sajjan Jindal) Rs. 125 cr. in this year for the use and promotion of the brand. The problem though is that JSW Steel was primarily responsible for building the brand in the first place. That means, shareholders first paid to help build the brand, and then, they’ll pay the promoters that own it. And then, Rs. 125 cr. is about 30% of its consolidated net profit of Rs. 400 cr. in FY 2014 (and 10% of the standalone net profit) which is a HUGE amount to pay! The concept is not a good thing in corporate governance, though it is practiced internationally. Even in the Reliance Power IPO in 2008, the company was paying ADAG – the Anil Ambani led promoter group – a large sum (around 45 cr. IIRC) to use the Reliance-ADAG brand, and other ADAG companies were following suit. This practice has even been followed by the Tatas, who demanded a 0.25% royalty on all turnover from their flagship Tata companies. What this means that promoters will find a way to take more than their equity stake – some with high salaries, others with things like “brand royalty”. There are more of course – where companies pay high rents to promoters for their offices (and residences of top staff), or where they will “merge” with promoter owned entities at inflated valuations. And finally, some companies give large supplier contracts to companies owned by promoters (and I’m looking at you again, Tata) without any real “arms length” separation. No one will oppose this. It’s how businesses do things, so it’s become a part of the game.